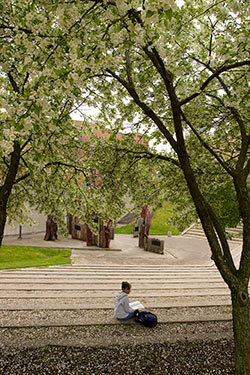 The Master of Humanities Program offers a unique, flexible, interdisciplinary opportunity for graduate study for both the traditional and the non-traditional student. Students are expected to explore questions from diverse perspectives, rather than to concentrate their study within a single discipline. A student's program of study might focus on a historical period, a cultural region, or a social or artistic theme, and may combine, for example, ancient and modern cultures, literature and politics, philosophy and art, or history and religion. The program is flexible because students design, in consultation with the director, their own integrated individualized curriculum, pursue full-time or part-time study, and attend evening and day classes. The program courses may be drawn from offerings throughout the College of Liberal Arts, including anthropology, art and art history, classics, communications, music history, philosophy, political science, religion, sociology, theatre, and urban studies. Students are also encouraged to participate in other interdisciplinary programs, such as the Women's Studies Program and the African and African-American Studies Program. Electives may be taken in other colleges when they are related to a student's goals and focus of study.